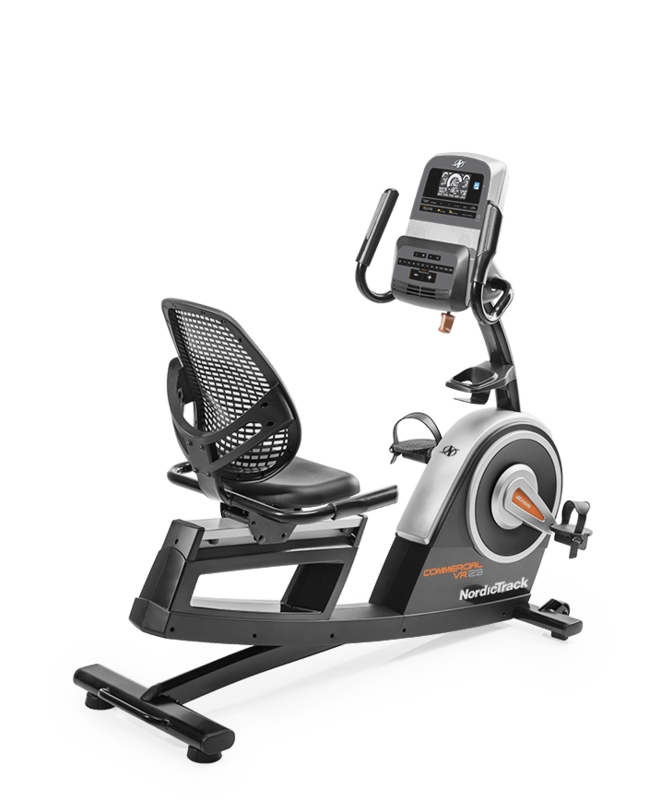 The Commercial VR21 is a new recumbent bike from NordicTrack, replacing the VR23 as the entry level model in the series. 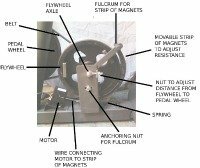 With commercial gauge construction, 25 resistance levels and 32 built in workouts, it's a great low cost choice for those looking to get into shape. The VR21 features a 5” backlit display offering all of the important workout details such as distance, time, calories, RPMs and more. It has a compact walk through design for easy access. Check out the new NordicTrack recumbent on sale now at the store! The VR21 was recently introduced as a replacement for the VR23, although we're not quite sure why they did away with that model, as it was also relatively new. The two models are quite similar...although the VR21 has a 5" backlit display vs. 7" on the VR23. Other than that, the two bikes are relatively the same. You get commercial gauge steel construction, a ventilated lumbar supported seat, extra wide ergonomic pedals and a new StepThru design that allows entry and exit to be seamless. The NordicTrack VR21 gives you a generous 25 different digital resistance levels to choose from as well as 32 diverse workout apps, so you can really change up your workouts from one day to the next. You can monitor your heart either with the grips or wirelessly if you have a Bluetooth chest monitor. Using wireless monitoring gives you a more accurate measurement, but if you don't have one the grips will be just fine. Note that the uplevel VR25 model has the heart rate monitor included, as well as a touch screen with internet. Another great feature on the VR21, and all of the newer NordicTrack bikes, is iFit Coach, an all-inclusive fitness package that gives you additional personal trainer designed workouts, tracking and sharing capability and Google map integration to replicated outdoor rides anywhere in the world. It does require a yearly subscription, but it's worth it for all that it offers. Some of the other nice features on the VR21 include OneTouch controls that allow you to change resistance easily, an integrated tablet holder, oversized workout fan, water bottle holder and transport wheels for easy mobility. Any negatives? Not really. We're not sure why the display size decreased from the VR23, but that's not a real deal breaker. You get plenty of features and capabilities and the bike is only $799 on sale, so you really can't go wrong. 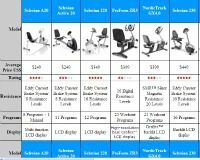 Note that with some of NordicTrack's cardio equipment, iFit membership is required, although at the time of this writing that is not the case on the exercise bikes. That may change in the future however. The new NordicTrack VR21 is a solid recumbent choices with plenty of good features to keep you motivated...you get 32 workouts, 25 resistance levels, a comfortable, supportive seat, easy controls and heart rate monitoring to keep you in the ideal zone. If you opt for iFit Coach you get even more training tools, additional workouts and the ability to choose where you train as the scenery unfolds right on your tablet. All in all, a very solid entry level bike for those who enjoy diverse workouts and varying resistance levels to make things more challenging. Check out more bike info and special sale pricing here!